Opinions are from our experience and of course, our viewpoints only. Too Lazy to Brush Your Dog's Teeth? One thing I love about Calgary, especially being born and raised here, is the support of local businesses. These are businesses, that are owner run. You see them at the front of their business, and the pride they put into their business. Supporting local business is so important, as your hard earned money, is going to someone that is working hard to be the best they can be, for you, the customer. More and more businesses, even vet clinics, are getting bought out by big companies. What does that mean for you as a client? Less care, less attention. To us, you are not just a number. None of us are supported behind big box stores, or money making umbrella corporations. Every service and time spent, is from our hard nights working and sweat equity. Our countless hours outside of business hours, to be a part of your community. To be a part of your family. Today I wanted to write about these small businesses, that not only support and uplift each other, in the industry, but local rescues, and what the community of Calgary needs. That alone I feel, is pride in ownership. There are many out there of course (but these are my top 10 in the dog industry), and we would love to know more, so comment below and link it on our Facebook Post. During tough economic times, it is the glue between all businesses, that keep us going! Pooohbusters. This amazing strong couple, have helped many dogs over their career path - not just for poop scooping, but helping with dog training. This is how we first met. Without going into much detail, this mom and pop shop, with hard work and drive, now run the top Waste Removal business in Calgary - and growing! They give back to the community in many ways, including helping support local rescues in their fundraising endeavors, and staff so many Calgarians. Tailblazers Copperfield/Brindleberry: I met Holly when she came out strong with her photography business. Her ability to light up any photo, and bring out the joy in dog and human, let us cherish all the memories we have with our dogs. Little did I know, due to her humble nature, that she also ran one of the most active Tailblazers in Calgary. Did you know they are all individually run, and not all are the same. Before Sleep Rover Dog Boutique, I use to drive all the way south, just to buy my food, and dog beds and anything cool from her store. Holly always kept in tune with the industry. Now she runs a top notch educational blog. Make sure to catch up on her posts. Doodle Dogs YYC - being the new kid in town, we were intrigued to know, why Doodle Dogs is one of the best dog boutiques in Calgary. Their store is amazing, and the owners Meg and Corey are always looking for what is cool and fashionable, with a focus on pet nutrition. Not only did they welcome us with open arms when we went shopping, we have since become great industry supporters. A true meaning that you do not have to be the one and only to make it in the business world. There is room for everyone always - and supporting each other, helps everyone grow. They launched a beautiful grooming salon last year called DOODLE SPA - and the transformations are top notch. If you want to be fashionable for Rover, this is the place to be. It is my most favorite place to shop, as they always have something new. PLUS they are super active on Social Media. Another bonus, they have an online shop! So if you are far far away - you can still have a fashionable pup! Dr. Dekens & Montgomery Vet - I have seen Dr. Dekens around, before Sleep Rover was ever opened. He use to volunteer his time to train dogs at Sit Happens - and back then was calm and positive. Few years later, we got introduced to him - and it was an honor. He is one of the longest standing Calgary original vets, with a private practice. He attends all local functions to educate the public, and last year, opened a state of the art vet clinic in Montgomery. What is awesome, is he supports raw feeding, AND does house calls. You want a vet to trust, and a vet with experience and love for dogs. It is not much to ask for, but sometimes so hard to find. Urban Dog Market - I met this gorgeous lady Melissa, when we got approached to be part of an event her husband and her created, to raise money for AARCS. Paws in the Park. Most companies, would veer away from companies that might be ‘competition’ to them, let alone ask them to be a part of their event. We were honored. Even better, one of our foster girls ‘SURI’, a white mini bull terrier, captured her eyes, and landed the best furever home with them. Her name now is Rosie. You can see her modelling (or sleeping) in their store, right in Marda Loop. This little adorable boutique is stocked with the most fashionable and yummy dog items, AND has a small dog daycare. Global Pets Cochrane - Same with the other franchises, not all are the same. The ladies at Global Pets Cochrane are always taking part in any fun event we have. Their store is STOCKED to the max with EVERYTHING pet - and they are changing it up always. It might be a drive to Cochrane, but it is a gorgeous place to walk your dogs, hang out, and then spoil Rover. Make a trip out there, as you will always get welcomed with a smile there. Fiona and Christine are just such huggable, loving people - to humans too! Plus you can stop for Ice Cream on your way back into town. Cultured Canines - all I have to say, is lead by example. The training world is a difficult world. Just like raising kids, there is never ONE right way. I love Beth and her crew, because they trek through all controversies, and lead by example. Actions always speak louder than words, and their students rep that. Promoting well behaved dogs, means they can live the best life there is. Walking well on leash, going to public places and enjoying life, with a few simple rules. Let’s be real, it is training the human that is the tough part. 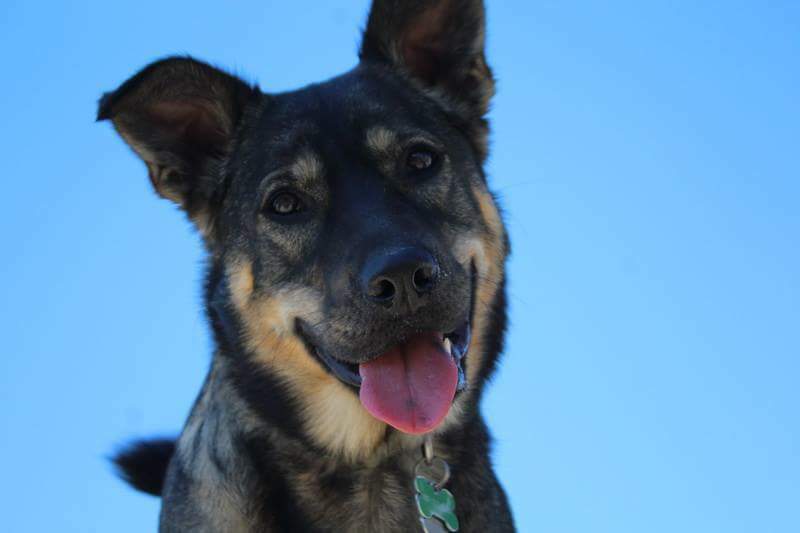 Beth is always helping out in fundraising events, and super active in dog activities in the Calgary Community. A strong responsible breeder supporter, this girl is here to keep the integrity of the dog community strong. From puppy classes, puppy socials to consistent dog courses - your dog is set up for success. Bon A Pet Treat - this little cute bakery started it all (2006!!). Make sure to stop by for a treat on your way to Banff, as this adorable shop is right off highway 1. Emily is always in every Calgary event, supporting the community, and spoiling the community dogs with delicious HEALTHY treats. Her focus is to promote dog nutrition, without faltering on quality and taste. My eyes light up, at every booth they make up. I sometimes feel like I go to all the events they are at, just to buy my dog treats. Drool worthy. Do not miss out on their yearly Stampede Breakfast. The Dog with a Bow Photography - I had been admiring the work of Paul for a few years. His ability to capture why we love dogs, is stunning. Last year, I finally signed up for my first session, and seeing him in action, shows why, he is able to capture these moments. He does not mind getting down and dirty for the most perfect shot of your dog. He is super friendly and calm. He also does not rush you, or get frustrated. Although these seem like basic criteria for photography, you would be surprised how hard it is to come by. Paul also consistently does photos for dogs in need. 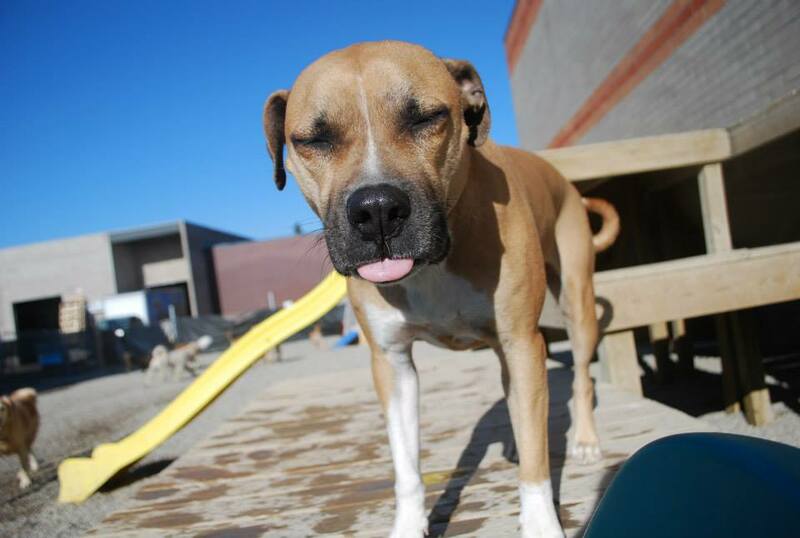 He is always taking time out of his day, to feature dogs in need of homes. He also helps out with a lot of fundraising for various rescues with his skills. Bark Industry - We met Chyves and Anna through hockey, and soon found out they started (well their dog Tony did), a dog apparel company. Famous for their adorable, functional backpacks, this company caught the eye of the Dragons Den. Super active in the dog community and social media, these 2 take customer service to the extreme, but delivering locally straight to you. Custom fit and answering all your questions about their product, that also consist of cooling jackets for the summer, winter boots for the winter and functional dog accessories for you. We all have the choice of where to shop and where to go, to spend our hard earned money. Know that supporting local, feeds back into the community, and allows us to support the community back. I want to thank all our customers and clients, that even during a downturn of the economy, they still support us. They still will spend a few extra dollars just to buy food from us, or sign up their dog for daycare once a week, just to help us out, even when times are tough. As our last year of lease is approaching, we are excited to still be around, and of course, to give back more, once we settle in a smaller facility. We have exciting plans for 2020, and cannot wait to give back to our long time supporters, and these amazing local businesses. Together we unite and thrive. Last year, 2018, my goal was to Road Trip more with the dogs. This year, I wanted to amp it up, and do something at LEAST once a month. 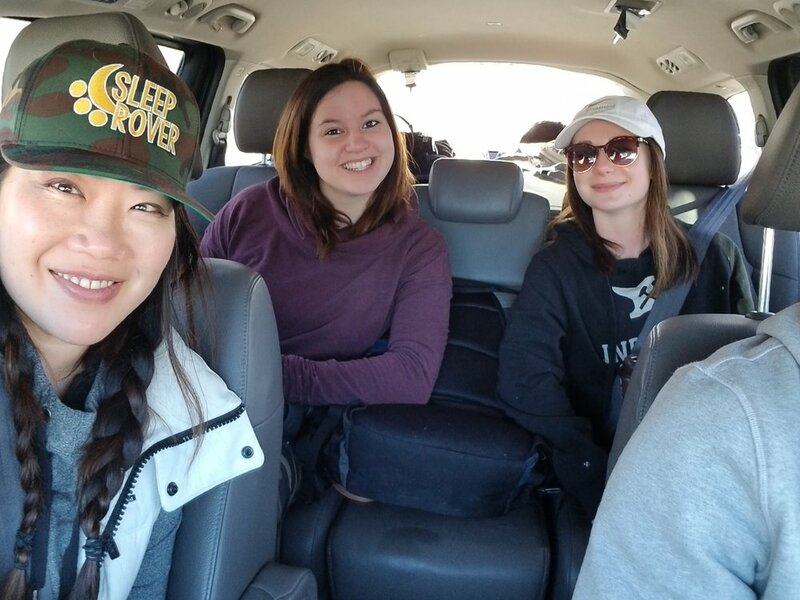 January 2019 - we tried out Kananaskis, something close by. Kananaskis is just about an hour away from Calgary. It is also a super dog friendly. You can drive in and stay at the Pomeroy Kananaskis Mountain Lodge that is Pet Friendly and get Room Service. The next day, take a hike at nearby Troll Falls or Elbow Falls. Super easy, and a quick getaway. If you have time, the Nordic Spa. We went mid January to the Mountain Lodge to celebrate Shogun’s 10th Birthday. They are not breed discriminatory there, nor do they have a size restriction. WE LOVE THAT! They of course require you to have well behaved dogs, and respect their leash and clean up rules. Although we did not have time to venture the whole premise, they have a famous spa, the Nordic Spa, that recently got updated. Last time I went here, was back in the Olympic days, when my parents had a timeshare here. It has changed a lot since then. The decor is great. There is a skating pond out back in the winter time too. We ordered room service, and it was good, not Vegas Room Service good, but good. Beds were clean and comfy. The service is amazing. Everyone greets and welcomes you, and the staff are always asking if you are okay, if you are enjoying yourself. A hike to do, is Troll Falls. Do not follow Google, as it takes you right into Nakiska Ski Lodge. Just follow the signs, as it is a quick turnoff right before you go up the hill. The hike is ranked easy, and if we did not take so many photos along the way, it only took 2 hours back and forth. The distance is 3.4km. A very minimal incline. Hike Essentials - I love my handsfree leash from Ruffwear. I also recommend a harness for your dog, so they are not pulling on their collar at their neck the whole 2.5 hours you are walking. Amanda had her dogs equipped with the Hurtta Y Harness. For the winter, boots for your dogs do help, and of course, for the little ones, I put Jack in a backpack. 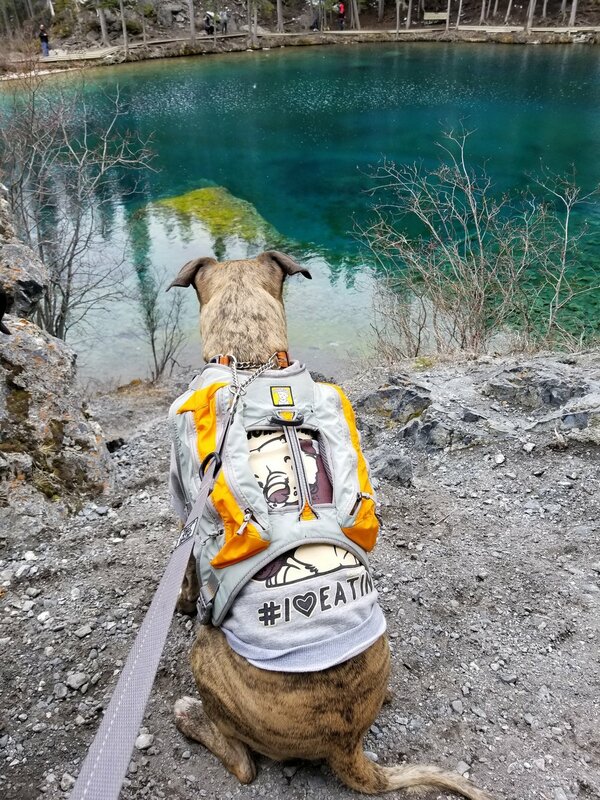 He was in the K9 Sportsack - I bought mine at Doodle Dogs! Another easy hike/walk are the Elbow Falls in Bragg Creek that we did last year. You literally park your vehicle, leash up your dogs and walk around the easy marked paths. Beware, this is a super popular walk, so go early, or you will not find parking. Photos by The Dog with a Bow Photography of my Crew! Be safe and respect everyone’s bubble on your visits. Just because your dog is friendly, does not give you the right to have your dog approach a human or another dog, without consent. 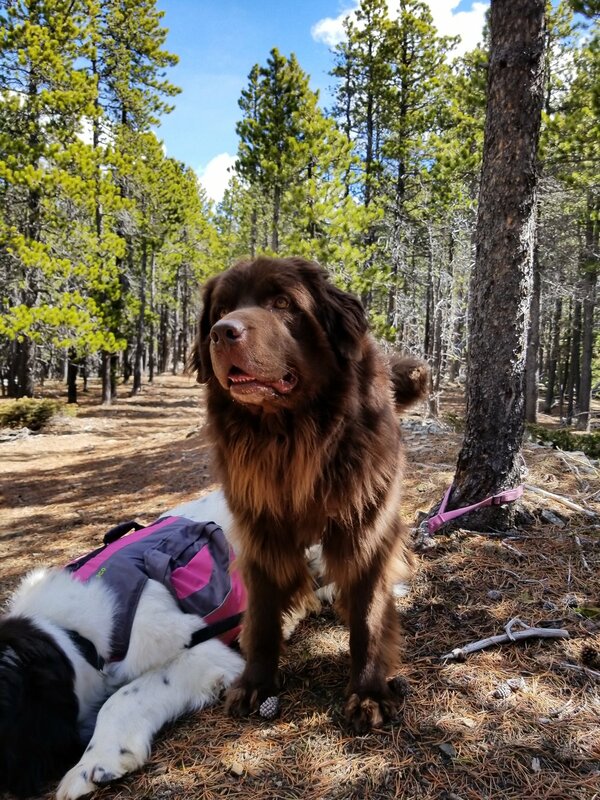 As courtesy on hikes, we always sit our dogs, and have them wait, and allow others to walk by us safely. Keep it #petfriendlycanada! When the cold weather starts to roll around, I find my dogs skin to be more dry (just like us humans). I start making them some gut friendly, good for them BOMBS. I first got introduced to FAT BOMBS when I started my Keto diet last year. Quick snacks that are good for me, usually consisting of high quality coconut oil and either a fruit or nut butter. I started making some basic ones for my dogs too - just because the molds, make their food look extra fancy! I have some super fun recipes that are easy for you to make. Rubber molds are recommended as it is easier to remove the bombs, and the designs are adorable. I have heart ones, bone ones and paw ones - all can be found on Amazon. That post was from 5 years ago where I solely used chicken - and since, I have really enjoyed using BEEF Marrow Bones and Knuckle Bones as well. Chicken Feet as well, create more good for you collagen. Remember you can save some to make soup for yourself too. a) Step 1 - Warm up the premade broth. You can serve over dog food at this state. b) To make Bone Broth Bomb - warm one cup which usually fills 2 molds full! c) Spoon fill your Rubber Mold of choice with broth - feel free to add a parsley leaf in each. Parsley is loaded with vitamins and antioxidants. d) Freeze overnight and serve (or 6 hours)! A great treat on those hot days. COCOBUTTER BOMB: Coconut Oil and Natural Peanut Butter - super delicious - every dog loves! I highly suggest choosing a high quality Coconut Oil. It gets a bad rap on some sites, because people choose the cheapest out there, which of course, the cheaper it is, MOST likely, you are getting the ‘left over’ grinds of the product. I get my 2 products from Blush Lane Organics in Calgary, because they are really good at sourcing responsibly. When you purchase your Peanut Butter, make sure there is no sugars added. As natural as possible. c) Step 3 - add 1 tsp of Manuka Honey. I rave about Manuka Honey for myself during flu season. Read more about it when you feel under the weather. Add 1/2 Teaspoon of Cinnamon to the mixture. d) Stir and spoon into molds. At this point, you can throw in a few blueberries for some extra fibre and nutrition! FOR MORE FUN - you can always start with Coconut Oil first (save a teaspoon for Step 2) - and fill the molds half full. Place in fridge for a few hours to solidify. Then spoon in the warm peanut butter mixture (with a little bit of the melted coconut oil for liquefying purposes) right on top and place in fridge again. It will give it a color layered look! Kefir Gut POP - Kefir Milk or Yogurt have probiotics to help with your gut. Teamed with some inflammation control ingredients such as Cinnamon and Parsley - it is a good for Rover treat! a) Combine all ingredients together in a bowl and mix - by hand for more chunky, mixer for more blended consistency. 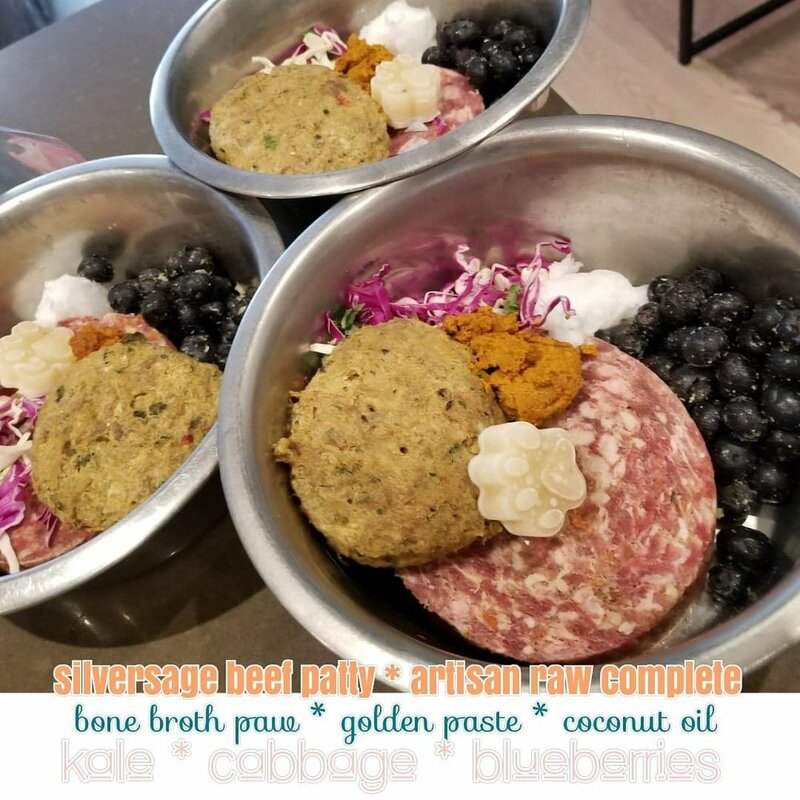 Combine 1 cup Kefir Yogurt or Milk, 1 Tablespoon Manuka Honey, 1/4 Teaspoon Cinnamon, 1/4 cup of fresh Parsley, 1/4 cup of your dogs favorite food (I chose Blueberries and Bananas combined). b) Spoon info or pour into molds and freeze in Freezer overnight! Hope you and your dog enjoy this special time together. Trust me, they will want to lick the bowls after! At the end, they do not care how you serve the food, as you can see below, on my ‘plop’ method. The bombs are just so much cuter. We get asked often, what I do, to keep my dogs teeth so clean. My own vet even asks me. In my 25 years of having dogs (gosh that is a quarter of a decade) on my own, none of my dogs have needed Dental Work done (knock on wood). Some dogs sadly, are just born with bad teeth. Could be genetics, breed or just bad luck. 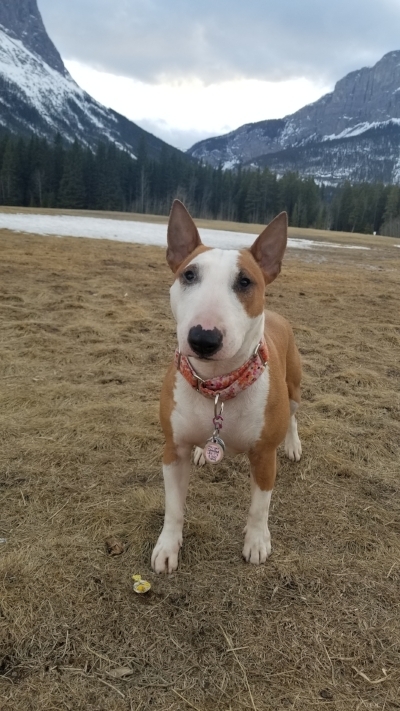 My Bull Terrier Azumi will probably be the first dog I have, that will need dental work, due to her jaw structure. However minus the above, you can maintain great dog teeth till their senior years with proper diet - yes that means proper Raw Feeding (with bones!). However not all of us can do raw feeding, so daily ingestion of kibble, builds tartar, with nothing to rid it. Imagine you eating pure carbs, sugars and processed foods. Raw bones provide great chewing with nutritional benefits (like calcium, minerals and collagen etc). The motion of the dogs back teeth, trying to get the meat off the bones, moves and brushes away tartar. Like toys - to be safe - SUPERVISE all dog chewing - I suggest to take away bones when they are small enough to choke, or after 20 mins of chewing. I usually recommend 3 things to our clients. Bully Sticks being first, Dental Treats (which there are not many natural ones out there) and my most favorite, raw meaty bones. Over the years, I have gone from Knuckle Bones, to Marrow Bones to necks etc. This year, my most fave that I am recently implementing into my dogs diet, are beefy neck bones. Rib bones are great as well - but they have minimal meat. For smaller dogs, Chicken and Duck feet are great as well as chicken necks. Both provide bone and meat. DO NOT be alarmed to find your dogs stool is more firm. I also suggest Feet and Necks for dogs with looser stools. The bone content firms up poop, and is why raw fed dogs, are a pleasure to pick up after. At Sleep Rover we sell Artisan Raw Rib Bones and Neck Bones as well as Primal Pets Turkey and Chicken necks. My 2nd choice are Bully Sticks. Make sure the treatment on them are done by reputable companies such as Hero Dog. I love Bully Sticks because it literally is one ingredient. HeroBullySticks™ are a 100% natural, dehydrated and government inspected. Our bully sticks are low odour, meaning these are washed inside and out before drying but are NOT treated with any chemicals to reduce the smell. Our bully sticks are an excellent long lasting chew treat, a great source of protein, and suitable for all dog sizes. HeroBullySticks™ are free of chemicals and preservatives. They are low in fat, and easily digestible. HeroBullySticks™ are product of Brazil from free-range beef, and are USDA, CFIA, FDA approved. Third, for an easy treat that you just pull out of a bag, are the Dental Chews. So many out there, but we chose the Merrick Fresh Kisses due to them having ‘better’ ingredients versus the Pedigree and Greenies. I also credit the K9 Gentle Dental team for cleaning my dogs teeth every year. Not only do they remove the tartar build up on my dogs teeth, they help me check my dogs teeth every year, track it, so I can report to my vet when needed. No need to put your dog under. The dogs are comfortable and treated so well. Not all teeth cleaning companies are alike (just like all dentists are not) so do your research. I was so happy when May rolled around - even tho the snow this year, seemed to linger around longer than ANYONE wanted. I made a goal for 2018 - to go somewhere at least once a weekend every month, with my dogs. Afterall, my life revolves around them. I've been searching trails via ALL TRAILS - so far so good. We started off easy on our visits this May, short and sweet - and the dogs, always came home tired and fulfilled (or might be just my mind). There is something about leaving the city behind, that allows my brain to unplug. My body seems to relax and the gorgeous scenery, eases my body. On top, it allows Jimmy and I to reflect, talk and really get to know each other, all over again. I also started a travelling journal. It isn't too elaborate - but I miss the good old times when you can just flip through photos, and relive memories. Scrapbooking use to be my thing, however the time involved, just wasn't working out for me. So a journal, was the 2nd best thing. On top, it forced me to work on my writing again, a lost art in a tech world. Our first trip with the dogs was closeby. 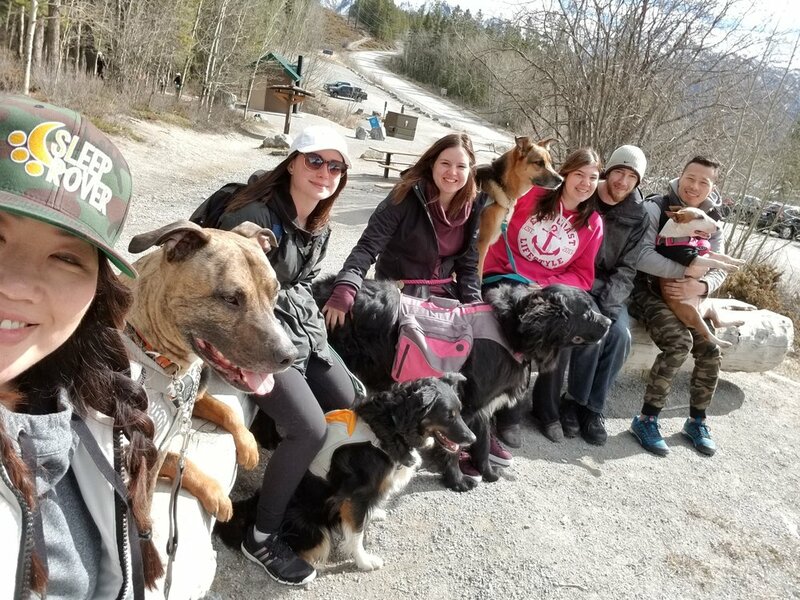 We hit up the Pet Friendly campground of Tunnel Mountain, as they are open year round. 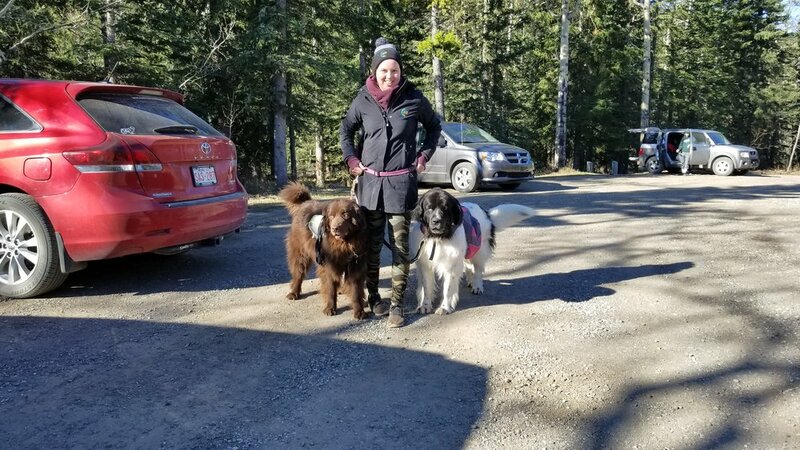 If camping isn't your thing, Hidden Ridge Resort is right behind them - and they are also pet friendly! This campground has all the bells and whistles. Shower and flush toilets.. but that view is beautiful. Another downside some people might not like, is the sites are quite packed in together. It is in the center of Banff though, so space is limited. Before we hit Banff tho, we always stop by my most favorite offleash park in Canmore- in Spray Lakes! We did a quick and easy hike to Johnstons Canyon. There you will also find a pet friendly accommodation - little adorable cabins. This hike is super easy and SUPER busy during the Summer - so go early. You can take it up a notch and hike up to the Ink Pots as well. The trails are tight and busy, so if you have a reactive dog, this might not be the best hike. Make sure before you leave, that you get some delicious pancakes at Melissa's Missteak. Although I'm not a pancake pro - they have the lightest and fluffiest pancakes. They are also well known for their Egg Bennie's. They keep it simple and breakfast menu is till 3pm. A few weeks after, we decided to take a longer trip, through to Radium. The drive there is gorgeous. We even saw a bear cross the road! We stayed at a gorgeous RV Site right inside Radium (Canyon Camp RV Resort), right in a Canyon. Don't get it confused with the Canyon RV site in Kelowna! They booked us right beside a tiny creek and it was so gorgeous. I wish we got the chance to stay longer. Staff were friendly and the resort is well kept and gorgeous. Did I say gorgeous already? Being a smaller site, you are quite compacted in with others. For little hikes - anywhere you stop along highway 93 is gorgeous (they have so many pullovers for you to take advantage of safely). You even trek through a section where it was devastated by the 2016 fires. We chose 2 spots this time, Numa Creek and a casual stroll to Marble Canyon. At Marble Canyon, there are other trails, such as Tokkum Valley that you can trek through. It is gorgeous! Wrapping up May #doggietrips is our visit to Saskatoon, a 6.5 hour trip east to visit some great friends and our god daughter! Although most people might not know, Saskatoon is quickly becoming Foodie Central. Ayden (a famous restaurant downtown), was started by a chef who was competing on Top Chef Canada, and even opened 2 other restaurants in Saskatoon, which I have yet to visit. This trip we ate at SHIFT restaurant - highly recommended! We spent some time in Drumheller for a rest stop. Just before you enter the town, there is an offleash park you can let your dogs out, to go potty and stretch out. Their RV Park is right in the City, so it is great for kids. We decided to drive right up to Kindersley that night. It has grown so much since 10 years ago. They even have a Walmart. With a camper van, we can pretty much stop anywhere to rest. We walked the river along downtown Saskatoon and stayed at an inner city Campground called Gordon Howe Campground. Easy to find and great service. We really enjoyed it here. Showers were clean and of course, flush toilets. They are also very pet friendly, I even saw a cat on leash. We headed to Berry Barn that Sunday, about a 15 minute drive south of Saskatoon. It was gorgeous there, and pet friendly to walk around in. We enjoyed their perogy dishes and of course, their famous Saskatoon Berry Cheesecake. Breakfast - Spolumbo Sausage, Egg and Avocado - doesn't look good but tasted good hah. Sometimes you do not have to travel too far to get away and enjoy some quality time together. In Canada, especially Alberta, we are surrounded by nature's beauty. Just drive and make those memories. Everything else can wait. HELLO SPRING... #SRtrickytuesday is HERE! Amanda and I wanted to start something fun for the Spring! 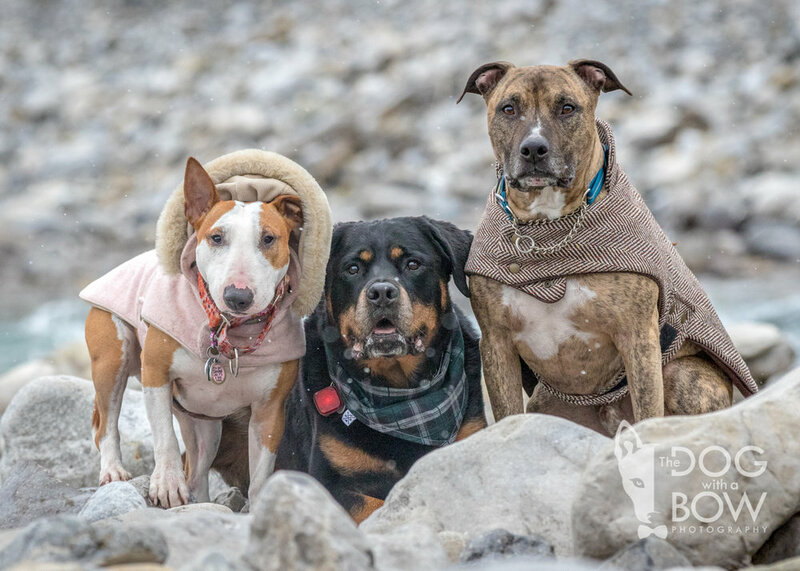 We often get questions, on how we get our dogs to sit all together for photos, or how we attempt to walk all our dogs on leash through the streets of Downtown Calgary. In this series, we hope to bring a fun approach to our love for dogs, and of course, to get to know all of our Sleep Rover fans. We have fans from all over the world, Hong Kong, London, down to Texas, or next door in Saskatoon! Each week, we will choose a winner, whether it be a free day of daycare, one of our amazing #sleeproverdogboutique items OR a gift certificate to support a local business. Speaking of local businesses, this first video of Shogun features a hip bandana from the great folks at Doodle Dogs off of Memorial and Parkland and treats by Drool Pawtesserie - yum to their Bacon Bones! We will consider all entries before midnight of that Tuesday, and announce our winner on Thursday! Each week, our tricks will get harder. On top - Molson from @BigandFluffyCrew and Shogun from @joycekao_sr - will have a TRICK OFF! Who do you think, can do the most tricks in one time? We will post voting closer to the end of April! Get your tricks all polished up folks! Tricks are a great way to spend some time with your furry friend, and learn patience, focus and.. the best part, all the laughs! This year has been super tough on all the girls and our clients - with so many of our original clients, arrivng at the Rainbow Bridge. This week, is our beloved Fynn. Although sad to see them go, every single client that comes in our door, has left a mark on our heart and taught us a few life lessons. Our tears may shed, but they will furever be in our hearts. A constant reminder to be happy, to make the best of the day, and to make others feel great! Be the person, your dog thinks you are. Fynn..beamed happiness. He was a depiction of his amazing family. 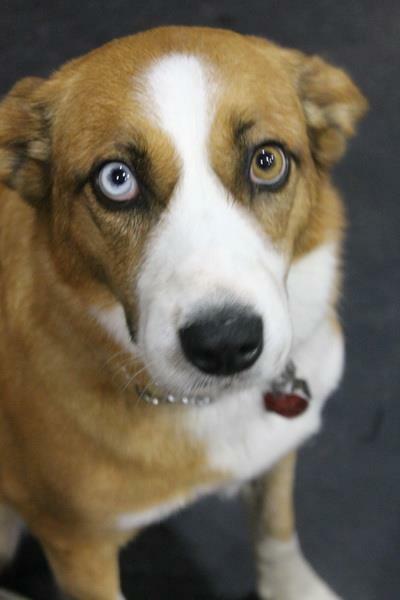 His sister Keena was one of our first clients when we opened and we quickly fell in love with the whole family. They always welcomed every single #teamsleeprover with love and joy. Their furry family quickly grew to 3 with all their adopted animals and their human family followed with 3. Never did they skip a step with putting their dogs on the back burner. Weekly daycare and our support when things were tough. Words of wisdom and kindness pushed us through. The meaning of family, is what this family exudes. Fynn loved eating and loved all the toys he could get his hands on, especially balls. When not playing, he loved snuggling with his sister's on the couches at Sleep Rover. He was so strong the last few weeks and lived every day to the fullest with his adorable smile. It reminds all of us here, that every moment is so precious with our loved ones and to make efforts in spending all the time you can with them. You will never have time, just MAKE TIME. We started this 'feature' in memory of Bosco and Fynn, to show off our old, original clients. Through thick and thin, through happy and sad, them and their families - have been by our side. We too have watched them grow and flourish in life. We thank now, all of you as well, for being a part of our family. Please enjoy our weekly features on Instagram, as of today. We love you Fynn, furever. Our main man! 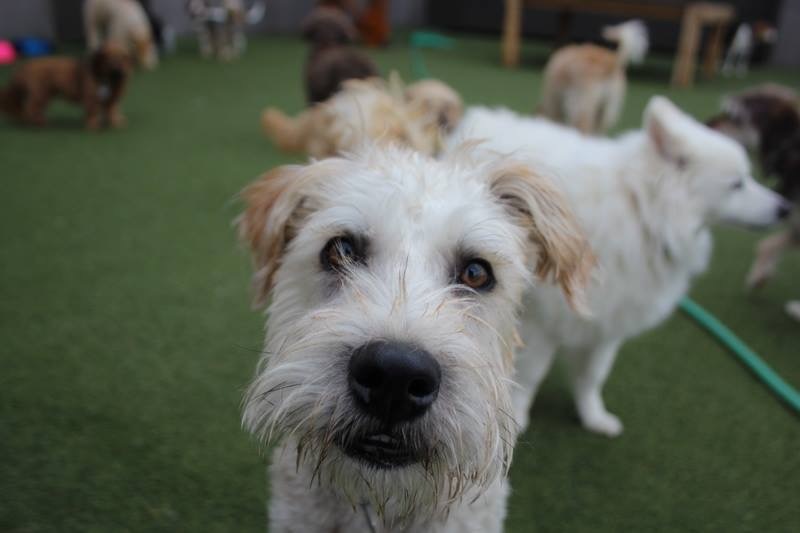 This is Stewie, he is our doggo of the week! He has been with us for 6 years and comes for a run around almost every day of the week!! We love his excited attitude as he runs in the door bright and early with his dad and he knows exactly where he's going! Thank you Stewie for being the goofball you are and always loving life here, WE LOVE YOU! Now a word from Stew! We at #sleeproverdogboutique - carry amazing outerwear for dogs! Quality, well thought out and stylish! Our newest addition is Hurtta from Finland! We also carry Canada Pooch, RC Pets, Milk & Pepper, Chilly Dog Sweaters, FabDog and our Winter Essentials Feature this month - Ruffwear! Click on the link's below to be directed to the website for more info. Our very own Dot is modelling our largest Fernie Sweater in Larkspur Purple, Polar Trex Boots to protect her feet (that actually stay on!) and a Handsfree Roamer Leash to keep your human hands warm! Holiday Shopping Suggestions for that Dog Lover! Sometimes it is hard to purchase a gift for that person in your life, however if they love dogs like we do - getting a gift for them to spoil Rover, might be a good idea! At Sleep Rover, our love of anything awesome for dogs, is our passion. Our manager Amanda and I, attend a yearly conference, to see what is new, what is great and what is needed, in all dogs lives! #sleeproverdogboutique - stocking the best for dogs, in treats, food and apparel. Take a quick peek in our boutique with this video! If you want to keep it simple, everyone needs a dog tag! Do a combo of treat & tag combo. We brought in the MY FAMILY ID TAGS from Italy- so that you can personally engrave your own dog tag at Sleep Rover. A great gift combo is having a dog tag chosen, engraved, and wrapped with ribbon around a bully stick. We were super choosy about which company to bring in, and the quality of tags, the variety and ease of use for this was hands down the best. Pair it with the company that gives back, a Canadian Company, HERO DOG treats! Read about this amazing company. Amanda's choice this holiday season is outerwear. Her goal for the Fall/Winter 2017 season was to bring in as many stylish and quality outerwear for all dog lovers. 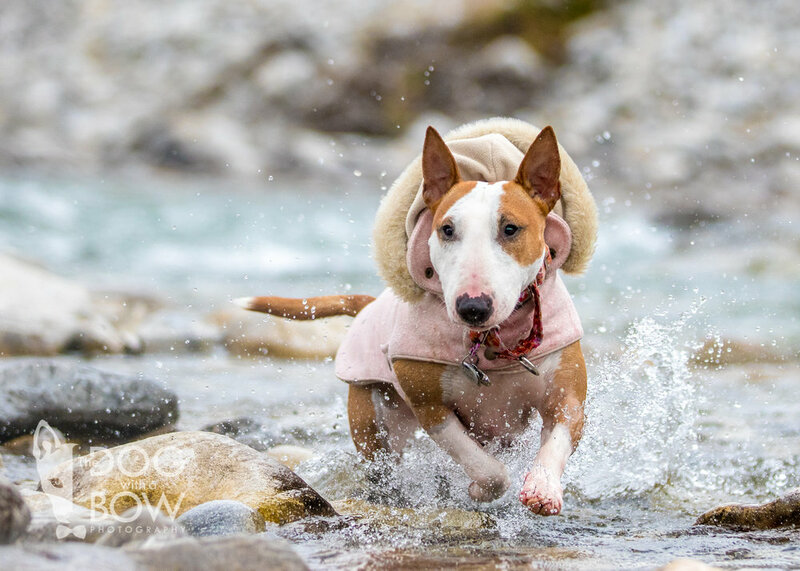 Whether you choose the more affordable sweaters from Chilly Dog Sweaters - to the Canadian Weather Inspired Canada Pooch - and the top notch, fully warrantied Ruffwear Dog Performance Gear - we got you covered! Lastly, our third choice - is a SPLURGE! Every spoiled dog has a fancy bed. Not only does it add a hint of style to your home decor, it is the best way to pamper Rover. I mean they spend a lot of time sleeping! We are so lucky that one of the best dog beds is made by a Canadian Company called Bowsers! The most popular styles are the Piazza and Donut Beds - however their newest style, the Divine Futon is a great mix of both! Those new fabrics are to die for - and look at how happy Bourbon is! When you order through Sleep Rover, you save on shipping! We hope we helped make some of your choices easier! Do not miss out on our Rover Market, dated December 3rd from 1pm to 4pm at Sleep Rover! Local Vendors will be showing their wares for sale - AND we will have some amazing in store specials! However if you do not want to miss out on select items, come soon, before they are sold out! 7th Annual Operation Santa Paws - How Can You Help Make a Difference? It does not matter how much you donate, to make a difference. It is the thought and efforts that count, that mean the most. Little Things Make Big Things Happen! Whether you can donate $1, or $100 - you can help even if you have no funds, by sharing this post to other animal loving people. That itself, is a form of donation. Another way you can help, is to gather your co-workers, friends, people at the gym, or family together. Sweat equity is sometimes more important, than the actual monetary donations. Each one of you, can help make a difference, this holiday season, for these animals in need. This year, we have added Saving Grace Animal Sanctuary. Their philosophy is quite like Heaven Can Waits - they take on cases, that some rescues are unable to. Therefore they have longer staying animals, sometimes with health issues, behavior issues etc. Long term residents at these rescues, not only cost daily on food and resources, but man power and utilities - including laundry, training and ongoing medical bills that pile up. Not only does Saving Grace house dogs and cats - they also take on livestock. 3. SAVING GRACE ANIMAL SANCTUARY: Buy a Bulb - Saving Grace recently attained another building to house more animals. With that, they need a few items to furnish this facility - to run efficiently. Funds towards a new washer/dryer, Pee Pads, Buckets for livestock, monetary donations to help with their outstanding vet bills, dog food, cat food, hay bails etc. You can find these bulbs at Sleep Rover, hanging on our trees. Just pluck one, and pay at the till, and your monetary donation will be tabulated. Amanda & I will then purchase the items and deliver to them - and we will vlog the whole process! We look forward to another successful year. This event is great to share with your friends, family and co-workers - no need to do it alone! Not only does it bring us all together, it puts more hearts, hands and love into the project. THAT is what the holidays is all about. Giving not just material things, to others, but sharing the moment together. I know our girls - especially Amanda (tis her season! ), put countless, endless hours, on getting this event together. It fills our building with Holiday Cheer. The love spreads like wild fire, and we are so happy, to be able to share this, with all of you! Images designed by the amazing and talented Nandi! Everyone in Calgary from 2015 to 2016, felt the depths of the economic crisis. Closed businesses, lost jobs, reduced wages, increase minimum wage, gas utility increases etc. With everyone's support - we thank you - for keeping us afloat - and here, celebrate our 8th birthday. 2015 was the year we chose to move as well - and a few bad decisions on my part - landed us a stressful 2016 at Sleep Rover, to which our existence was wavering on a teeter totter (do they even make those anymore?). I jumped the gun, and recommended on easy by the super fit dog walker Sharyl with Adventures in Dog Walking - went to Cox Hill Ridge. It is a far cry from our Grassi Lakes 'stroll in the park'. I would suggest doing a few shorter mountains first before this 'hill'. It is quite steep and at 14km round trip - it is quite long. The description advises the hard stuff is in the beginning, however the whole hike was a climb upwards and some loose and jagged rocks near the top. Hiking sticks and boots highly recommended. To get here from Calgary is a quick hour drive off Highway #1. You take the Sibbald Creek Highway 68 turnoff and drive down some rocky roads. You will be making a left onto Powder Trail into a valley, drive a few more mins and make a left, before the gates, at DAWSON RECREATION AREA. If you want to make it a weekend trip, you can also camp at the parking lot by the creek. It is noted that you can also fish here. We started the hike early on this Mothers Day - arrived at the parking lot by 9am. Weather was perfect at 12 degrees C with a light breeze and probably hit closer to 5 degrees near the top. Layer up! The bridge is at the beginning of the pathway and offers a great view of the creek, where you can picnic at. Make sure to follow the human sign and not the horse sign. You will be taking the Cox Trail. There are plenty of spots to rest - which we did plenty, being out of shape. It is greatly shaded if you go in the summer. There is no water on the way up, so make sure to pack enough water. The 2 hours hike up was quite steep and tough - with the first hour covering most of the incline. The last 30 minutes were still quite tough, as the trail winded down in width. Remember to stay on leash to be safe and to respect nature! You do not get the satisfaction view, till you hit the top - so do not give up! When you think you have made it, you just have to keep going. Take some time for yourself and head up to the mountains to get some fresh air and relax with the scenery. Bring a friend for a nice chat - or, if you have a dog, even better. You will come back refreshed and relaxed. Sometimes you just need to unwind and enjoy the bigger picture - nature. We started the year off with a super easy hike only 1 hour and 15 minutes from Calgary - north of Canmore. It is super popular, because it is gorgeous, and super short and easy to get to. The paths are well marked and wide enough for your dogs. They do have a portapotty at the base of the hill. Going early is important, as because it is popular, you can bet that by 11am - you will struggle to find parking. We left Calgary late however, assuming as it was chillier today at 8 degrees, there would be less people. We arrived at around 1030am and it was pretty empty, around 10 vehicles, and as you can tell, there was still some snow on the paths. However this is a newer one called ALL TRAILS with maps included and more updated reviews. The lake is beautiful and the view is amazing. You arrive at the lake and there are benches for you to rest, snack and enjoy the view. For easy hikers, you make a quick loop around and head back down the same path to the parking lot. If you like a challenge, up the Lake is a steep path marked difficult. We love this hike as the end result is beautiful, and it is not strenuous. You also get your 10,000 steps for the day and come back happy and fulfilled. Happy dogs, happy life! For the first time in 7 years, I make this difficult decision, to stop any more new dogs from booking trials with Sleep Rover. Since our first Facebook Post in February - there has been an alarming amount of dogs, reporting that their dogs have Kennel Cough for the month of March 2017. We usually average 1 or 2 per season (Spring/Fall) - but within March, we have hit almost 16 dogs. Although we cannot pinpoint blame on any one dog ( as sometimes dogs who do NOT show symptoms, can carry the virus ), we can stop it where possible. Being an airborne virus, it is pretty difficult to 100% rid - but we have been very lucky, the last 7 years, to not see much of it! The common line with all 16 dogs - is they are new to Sleep Rover within the last year, more so, 12 of them are new for 2017. 2) Or have not built immunity to the virus yet, therefore showing symptoms, and spreading it. Although we take precautions every season, with our large Make Up Air Unit and cleaning throughout the day - this airborne virus has become a nuisance to our new clients for the month of March. Besides breaking our hearts (and yours, hearing your babies cough), and having the virus linger during this FLU Season, we have decided to stop all new dogs from booking for new trials, till we are in the clear. We have not seen any regular clients come up with symptoms, as most of them, have developed immunity to the virus over the years. Whether there is a new strain starting, or our new clients have never frequented kennels/offleash parks etc. before, we are not sure. We just want to be safe. YES it is not mandatory at Sleep Rover to have Bordetella shots yearly, and it has worked wonders over the last 7 years. However with that being said, 14 of the 16 dogs infected, all had their Bordetella Shots. As this is a touchy subject, just like the flu shot, we always leave that choice, to you, the parent. Please stay tuned to when we lift this NO TRIAL alarm. We are hoping for May 1st. We are sorry for this inconvenience, but having one of our younger new clients suffer from pneumonia on the weekend and many of you calling this week to inform that your dog is ill, was enough for us to make this difficult decision. If you have any questions, please do not hesitate to contact us. We are always hear to give suggestions including what to do, during flu season, to make sure Rover, can pass the season unharmed. This includes Oil of Oregano in the beginning of the season, bone broth soups to rinse out their system and extra nutrition added to their meals. All new clients, your trials will be cancelled for April. Please do reschedule for May when possible. Exceptions can be made for dogs, who have frequented other dog facilities in the past, and built immunity to the virus. Noting you have the Bordetella shot, will not be accepted for new dog trials. We will be cracking down on ANY hacking or coughing motions by your dog. YOU MUST pick up your dog immediately and not be allowed to return till your have a vet clear, OR 2 weeks, whichever is sooner. Lice? Tummy issues? Eye irritations. I wrote this back in March of 2015 - and thought I would transfer to our new site here for our new clients! Spring type weather (which we in Calgary have been having for the last few months) - brings on some not so friendly issues. It is perfect weather for viruses and bacteria to spread and dust and allergens to fly around as they melt. I decided to write a blog just as a prewarning to all dog owners. It is the end of February, and a client approached me today, saying that there apparently is a Lice outbreak in Calgary. 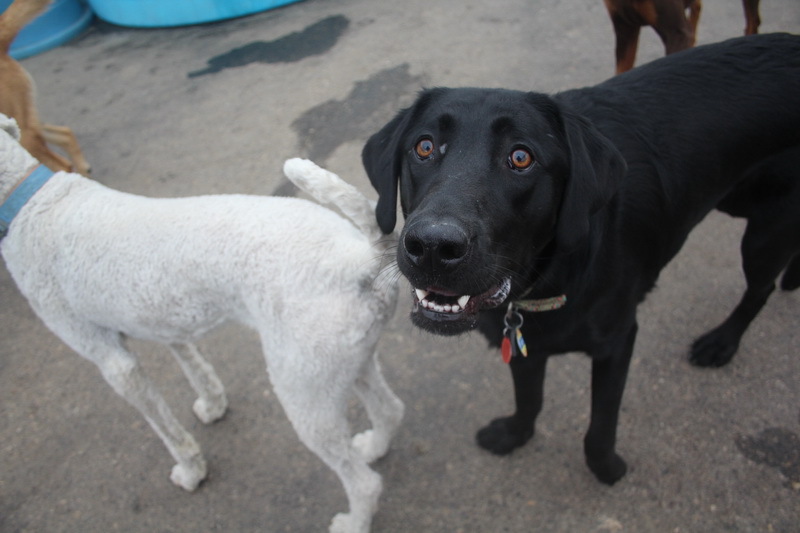 I had not heard anything, however a few weeks ago, one of our regular clients did find lice on her dog. He had long hair and was a big dog. Being it was the only case, I just took note of it - but if it is seen by other facilities, I thought it would be a good idea to give everyone a heads up. In our years of business- we rarely see Lice or Fleas - however it is the perfect weather for these parasites to appear. I usually do recommend using Revolution during these times - ESPECIALLY if you have long and thick haired dogs. ALSO, if you are planning a long vacation for Rover during these seasons at Sleep Rover - a dose of Revolution in the beginning of the trip is also recommended to protect your dog. I do however believe that we do not need to vaccinate with Revolution monthly as noted by some vets. Something that kills fleas, lice, heartworms etc - can not be that great for your dog. I personally *knock on wood* have not had any of our dogs get either lice or fleas - and every year, we have less than 10 dogs a year that get it client wise at Sleep Rover - which is extremely low. It is important to check over your dog regularly and note any extra itching and scratching. You can check your dogs near the ears, the neck, the armpits - is where they are most commonly found. Prevention during this time will save more hassle for you, compared to dealing with the infestation. The infected dog advised us immediately and did remain at home for over a week and we at Sleep Rover, wash our bedding every day. The chances of spreading and contamination are less - compared to the jumping fleas. We also have noticed a few clients advise of their dog puking. I have a dog poop eating girl - and what I like to use to rinse out her system, is a tablespoon of Apple Cider Vinegar. I would fast her for food in the morning and then give her Bone Broth for dinner. After it is back to her regular feeding the next day. Note that if your dog continues to puke non stop and display signs of lethargy within 24 hours - you need to rush them to the vet to insure that there are not any other underlying issues. This was the first year I have heard of snow mold! What is snow mold?? I guess many humans get allergies during Spring because of it - and I would imagine - is the reason why some dogs get eye infections. Of course dirt, dry weather - lots of things, will contribute to eye irritations! Having some eye drops approved by your vet on hand - are great ways to moisturize and rinse out your dogs eyes to prevent any infections. For me, I have basic saline solution on hand at all times for my dogs. When they get extra discharge - I will start giving them eye drops just to moisturize and rinse out anything bothering their eyes and it usually goes away within a few days. As noted, this is for the basic maintenance - if your dog shows more extreme signs, you will need to visit your vet. Anything from eye detaching, tear ducts, to eye infections can get serious if not seen by a vet. If you have any experiences with the above or have questions, please do not hesitate to contact us. Although these are inconveniences of having an active dog, it is important to let us know, so we may document and keep track of any occurrences, and of course, give you advice and suggestions. How to Make Your Dog Toys YUMMY! 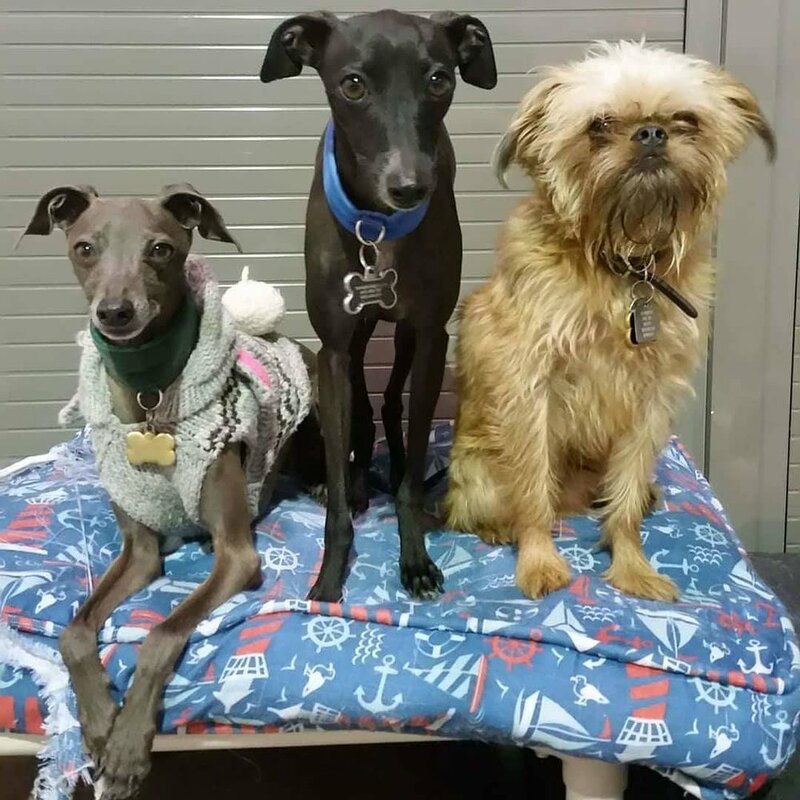 As Winter is on us full force, have you always wondered how to keep your dogs busy at home when they are not at Sleep Rover for daycare? Have you ever wondered how to feed Rover something nutritious when you are in a rush and do not have time to feed them? NOTE: WITH ALL TOYS & CHEWS, supervision is important. Cleaning each toy after food consumption is recommended. Take away any broken pieces of the toy, although the toys listed below, are safe. In this blog will be our top 3 toy choices (all available at your Sleep Rover Boutique), and our top 3 easy recipes. 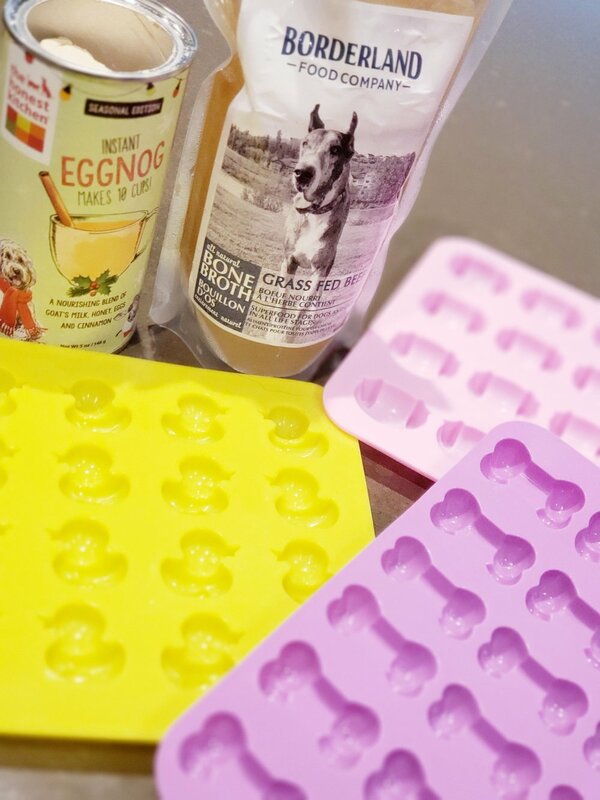 Here are some fun recipes to implement with some of our #sleeproverdogboutique toys! Please note, do not not use these recipes if Rover has allergies to the ingredients. Extend the chase and mental stimulation by making two of them, and hiding them in the home. I love the hide and seek game with my dogs. Just remember where you hide the items, in case Rover does not. The best ingredients to use for the recipes are ones with no additives. Less additives, preservatives and processing = less tummy upsets. Take note, as most of these items are perishable - you will need to freeze what you do not use, or put in the fridge for their life span. Make a few of these in advance, for those busy mornings. Just take it out of the freezer or fridge and off you go. Please note the calorie intake on these treats. These are treats, and not meal supplements. For an extra health boost, add Yogurt! When you are under the weather and need some comfort food! Upset Tummy? Need more Fibre? Can be frozen for an extra challenge! 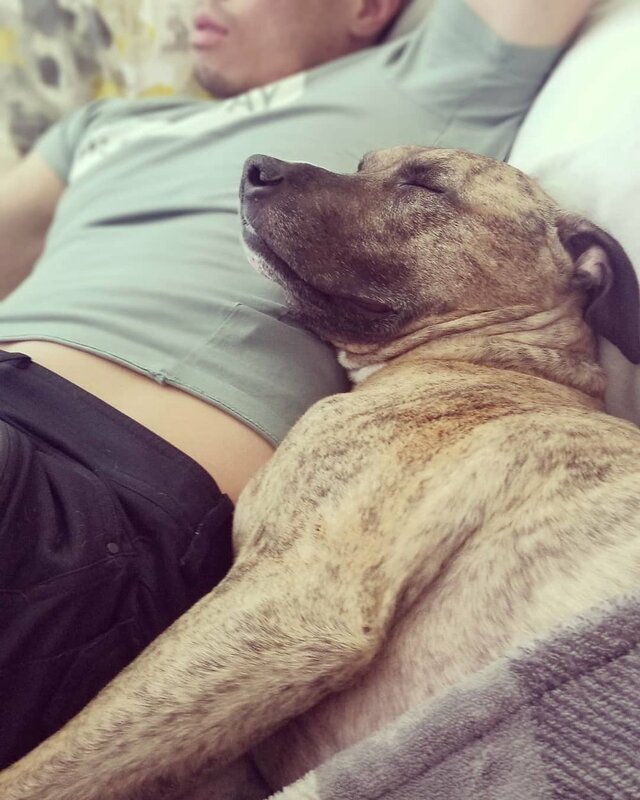 Feel free to share your photo's of Rover enjoying their treat - with the hashtag #sleeproversquad and by tagging us @sleeprover! For the month of February 2017 - mention this Blog and get 25% off the mentioned toys above! While quantities last. Training is a faux pas to talk about - because there is never ONE RIGHT method. For the trainers that believe their training methods are the one and only - well I truly believe, due to experience, that they are wrong. So always keep an open mind and consider all methods, till it works for you. Afterall - training is for you, not the dog. Like humans, we all learn different - same goes with dogs. To be honest, it is not the dog that needs training - IT IS YOU!! So if you ever go off on a tangent, on how bad your dog is, look in the mirror, it is YOU! This is why we have two different trainers, training out of Sleep Rover - and also recommend others depending on you and your dogs needs. 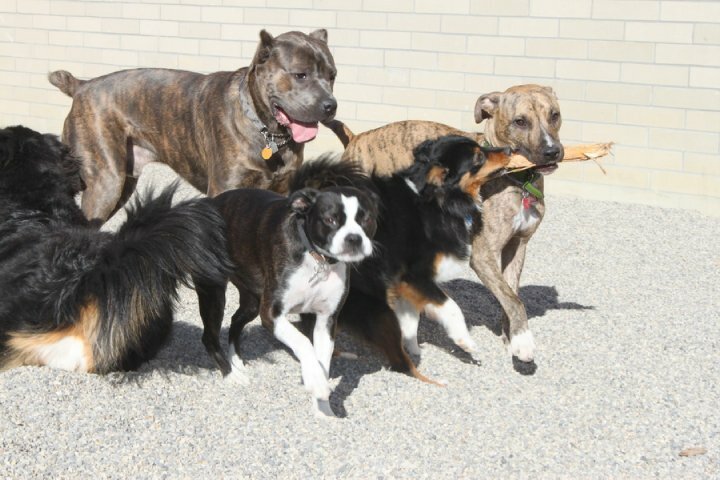 At Sleep Rover - we believe in pack mentality - that dogs follow their leader. If you, yourself are not a true leader in your household, your dog will not listen to you. This is why we are able to control a large amount of dogs in an open concept facility. If we do not take control of the dogs, they will take control for us. How you attain that trust and respect - is up to you. We do not judge. As noted, all dogs are different. How you decide to approach your dog's teachings, is your decision. Any harsh methods such as slamming and kicking dogs, we frown upon. No dog needs to be physically punished ever. Dogwit is a reward based, positive reinforcement training company who teaches socialization classes, obedience classes and reactivity classes. I met Drae when I first got Shogun into training once he was done his classes at Sit Happens. She taught him scent work and thinking outside of the box. It helped him use his other senses, and on top, make him more confident. It also taught me to relax and understand dogs more. K9 Psychologyis a pack mentality trainer. Katelynn trains with the goal of you being the leader. That the dog waits for your queue and direction. I love this method as well, because you want to be the one that your dog goes to first when they make decisions. That they seek your guidance before anything else. Cultured Canines - we refer a lot of people to Beth - to experience that Pack Walk mentality. Many people struggle with walking their dog on leash (more so they are getting walked on leash), reactivity on leash and of course - manners in a public setting. Beth's philosophy is that YOU should be your dogs treat! This blog post is more about what I believe, are the most important basics that you need to teach your dog, regardless of who you use for training. RULE OF THUMB: When it comes to choosing your dog trainer - make sure they can attain what you want to learn. Meaning if you want your dog to walk nicely, but their dogs cannot walk nicely - might be a good sign to find someone else. They should be the product of what they are training. Who cares about all the certifications? Like in life, actions speak louder than words. 1. HAND SIGNALS: As my eldest dog, Mei Mei, gets older - at 14, she has officially lost all her hearing. She is my first dog that I actually tried to train (meaning my first two dogs JJ & Siefer were not). I was the one that would be at offleash parks - YELLING for my dogs 'JJ PLEASE come back.. Siefer.. Do you want a treat??' - Nope - off they went - terrorizing and here I was.. hopeless and embarrassed. Mei Mei was feral as she came off the Tsuu Tina Reserve - and as you can tell - a little coyote like. She was tough to train with her fear. One thing one of our trainers taught us back in the day, was they trained US to use hand signals. We never even noticed her implement them in the training - but I am so grateful she did. As she trained us to speak to our dogs with the command, she also showed us hand signals. I miss her training! To sit, we lift our hands up. To come, we wave them over. To wait, we put up our hand like a stop sign. All these came into use this year, as Mei Mei is completely deaf. No amount of treat training or yelling or calling her, would work now. Now when we need her, we wave at her, she waits for our hand signals, and comes without us even saying a word. Although the image is of poor quality, please consider using these simple hand signals, to train your dogs! It is never too late! 2. RECALL - the most important training is RECALL. It can save your dogs life. No matter if your dog is a puppy, or you just rescued Rover - RECALL should be your top priority. It can start off as calling their name while you have treats in your hand. Progress further by hiding in your home, and then calling their name. Reward with a treat. Get to the point where every time they hear their name, they come to that voice. Whether it is yours, or someone elses. 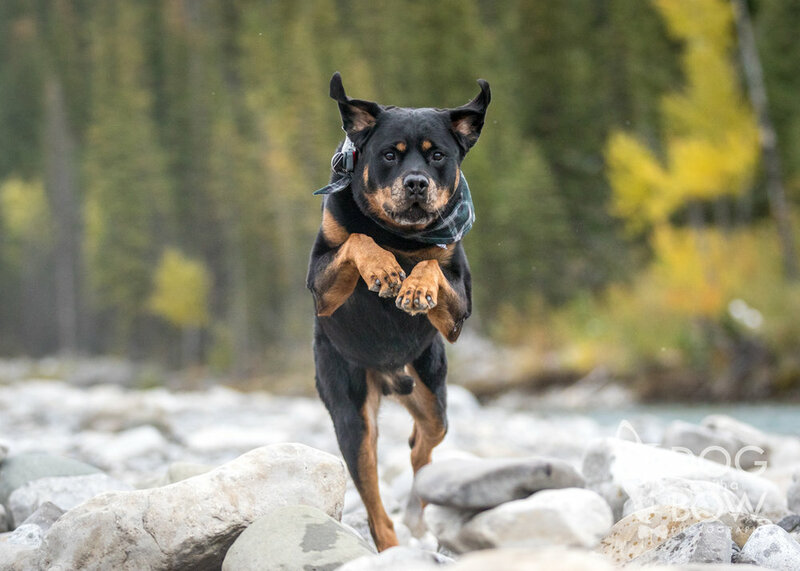 It comes in handy at the offleash park, on a hiking trail, if you lost your dog or just to snap your dog out of focus when they are chasing for that rabbit. RECALL is what I call, the foundation to all training. Once you master recall, everything else is easy. Dog Training is An Ongoing Task - not a one time fix - just like any relationship tank - you need to fill it up to keep it strong! Week #1: CALL THEIR NAME - if they look at you - give them a treat! Week #2: SIT - Call their name, do your sit signal while saying SIT - treat! Week #3: SIT & STAY - After they sit, give them the STAY signal and say 'stay'! Move back 2 feet. If they stay - treat! Week#4: HIDE & SEEK - Call their name, make them Sit, Stay and then hide somewhere in the home. Call their name - when they come, treat! Make it fun and add your family members and friends. Once you feel confident, move it to your yard and eventually, at the offleash park. 3. CRATE TRAINING - Many people think that crate training is mean. Little do they know, Crate Training is a savior for those dire situations when you need help the most. I did my first vlog in 2012 about Crate Training and still stand by my views. WHY? Lastly - for the quick errand - or when you go to work! Nothing worse than wondering what the dog got into, what they destroyed.. and on top - no dog wants to come home to their owner/parent yelling at them. Save your shoes, your furniture, your tummy upsetting garbage can.. or even a chance at them breaking the window and escaping! Get a yummy treat and crate them! Day #1: FEED: Feed your dog in the crate - so they relate eating, to crating. YUM! Day #2: RANDOM: Random treats! Have the kennel in the living room or family room - wherever you are when your family is together. Throw random treats in there throughout the day so they can go in and out. Day #3: WAIT: Start closing the door and then letting them out after 5 mins. DO NOT LET THEM OUT when they bark. Let them out when they lie down and wait quietly. If you let them out when they bark, they will bark in the crate JUST because it means they get let out. Day #4: SLEEP: Have the crate with you beside your bed and close the door. As puppies it is tough - but within a week, your puppy will sleep quietly beside you. Leave a chew in the kennel that they cannot swallow - so if they are not tired, they can chew on a healthy chew - such as a bully stick. MOVE: Gradually move the crate further away (unless you want the crate in your room). Within a week, your dog should be crate trained. Hope you found this blog helpful. Remember, we are here to offer advice always. Do not hesitate to ask. These are just tidbits we have learned together, as a joint team, from experience. Whatever makes our life easier, and our dogs happier - is our goal at Sleep Rover! I wanted to update my blog on Kennel Cough - due to our recent surge in new clients and of course - new ways to overcome Kennel Cough in dogs. I have also posted my original post from 2012 - which has not changed too much. This can also be found on our Facebook Fan Page as well as at the end of this post! Today is January 4th, 2016 - and this Holiday Season, pretty much the month of December - we experienced a higher than normal occurrence of Kennel Cough (compared to the last 2 years). As noted below - just like the human flu - where you have a choice to vaccinate yourself or not, we give this option for our clients as well. Being an airborne virus - there is not a huge set thing we can do, to negate this virus 100% from our surroundings. To date - the last 4 weeks, of the reported cases at Sleep Rover, which we posted in public on our Facebook Page - we received in total of 11 cases. All 11 cases but 1, were all new clients. All 11 clients, had received the Bordetella Vaccine. One client, progressed to pneumonia and is currently healing on antibiotics. So at 11 cases (4 of them young dogs, meaning under 1 year old) - and over 250 different clients that checked in and out for the last 2 weeks of December, that is less than 10%. It is still high for us, as the last 3 years since my post back in 2012 - we have maybe received 20 cases at most for the WHOLE YEAR. Total of 12 Lice cases for 2015 and a total of 2 flea cases. Remember, we have over 1000 dogs going in and out of our facility per month. Those are impressive and admirable numbers. We have a very healthy facility and clients that take great care of their dogs, and on top - we keep our clients in the know when we feel the 'seasons' are near - to prep everyone! It is safe to say, when it is human flu season, it is also dog flu season! One might ask why, if they got the vaccine, they would still get it and be sick. Not being a vet myself, I would assume this is due to the different strains that are ever changing. With proper measures - dogs usually recover from the Dog Flu within the week. I would say if your dog gets ill and shows drastic lethargy quickly and does not eat or drink - an emergency trip to the vet should be in place. SIDE NOTE: WE DO require mandatory vaccines for yearly boosters for Distemper/Parvo and of course Rabies! Over the years, my 6 dogs have not gotten the Bordetella shot. I have nothing against this shot for those that do take it. My boy Benjamin, at 6 mos old last year 2015, got the shot by accident (I forgot to advise my vet), and he proceeded to get Kennel Cough which progressed to pneumonia within a week. Did the Bordetella help him or not? That will always be the question. My other 5 dogs did not get it last year being around him. Instead of the shot, what do I do? Remember again, this is how I deal with my dogs, as well as our staff at Sleep Rover. If you do not agree, nor do you wish to have your dog in a facility that practices natural remedies - please do find alternate care at facilities with your mindset. When Flu season is upon us, I follow the same steps below posted in 2012, which is amp up the Broth intake for my dogs and add Oregano Oil. Over the years, especially for 2015 - I learned some more remedies - due to the fact that I myself, got hit hard with the flu in 2015. Lack of sleep, stress, and long work hours made me more susceptible to it - and of course my lack of working out and eating right. Here are my top 4 recommendations that I feel keeps myself and my dogs healthy! with special asian ingredients! Even when I was just under the weather. Always did the trick! Great for humans and dogs too! Adjust the measurements to make for yourself! I learned that this is good for dogs - when I started the "GOLDEN MILK" recipe for my joints. Getting older and on the computer so much.. and well, lack of exercise.. made my joints super 'creeky'. Like old stairs. I never thought I would understand that feeling.. but well - it has happened to me! After a week of this, I noticed the cure within 3 days of taking this twice a week. When 2 weeks past, I forgot to make a new batch - and within a week, my joints started at it again. After reading more about Turmeric Paste - I realized it not only helps joints, it increases your bodies immunity. It pretty much is nourishment for your body! FYI: You must add the GROUND pepper, to enable the turmeric's abilities. Heating it as well is extremely important - and well the oil helps your body absorb it. DO NOT MISS A STEP or you will be wasting your time and money. Also - Turmeric needs to be organic - has to contain the curcuma part of it. What is odd - i have trouble getting my husband to drink Golden Milk (with Almond milk) - but my dogs - get super stoked when the Golden Paste mixture is out! THEY LOVE IT! Start small at 1/8 of a teaspoon and work your way up! Of course - lots of rest and fresh air if possible! If you have any questions - please do not hesitate to contact me! I am always learning - and gathering more knowledge with experience handling so many dogs. What to know about Kennel Cough!! Our Views and Suggestions! Similar to the human flu - we at Sleep Rover believe it is your personal choice on how you wish to treat your dogs when it comes to the care for your animal. You have a choice to socialize your dog in dog environments such as dog training, dog daycares and offleash parks - or keep them at home. Bacteria related sicknesses, especially Kennel Cough are airborne - and any contact with dogs in a close vicinity - will get infected. Similar to humans - a stressed or poorly rested individual or someone who has not developed immunity to all these current bacterias in the world - will be more susceptible than another. Some get sick every month, some get sick every few years. Some take vaccines and do not get sick, some take vaccines and still get sick. I for one, do not take the flu vaccine, i am bound to get sick once a year (usually in Nov) and pretty much spend the year fighting certain bacterias - especially on days I lack sleep or do not eat well! My throat gets sore, I get groggy. However overall - I deem myself healthy! Will I not get sick getting the flu vaccine and live my life sick free - I doubt it. I can't speak for people that have taken vaccines if they feel 100% all the time! However I do know that getting a vaccine does not leave you bullet proof from getting sick. So in turn, I give this option to our clients. Bordetella and Revolution are optional - because I do not believe in overvaccinating. My philosophy is that we will grow our immunity and become more self reliant this way. However as noted - this is just MY opinion and you are free to do and choose what you feel is right. I also give the option to clients that if they choose to - they are more than welcome to vaccinate their dogs for their ease of mind. I will not judge as this is a topic that everyone struggles with not just themselves, but their dog also. Last year during our September 2011 Kennel Cough outbreak, which closed down two dog kennels in Calgary for a month - we had a total of 23 infected dogs clients reported. Just like the flu season might bring down your office (everyone seems to be calling in sick!). Out of 23 of the dogs, 8 of them had their Kennel Cough shot. So because they got their Kennel Cough shot - we are told it lessens the duration.. does it? During this time, everyone that displayed symptoms, we did kennel the dog and asked them to be taken home. We were Kennel Cough free into October. Reason why I post this now, is for everyone to see our point of view and our suggestions. Spring is coming.. if not has already been here for the last 2 months - so Kennel Cough is just around the corner. In the last 3 months, we have had about 6 reported cases - which is really low - however still in the air due to the warm weather. Preventative measures, is obvious, do not go where dogs go - however who wants to coup up their poor dog 24/7? That is no life for anyone. Another option is to avoid dog parks, dog training facilities and dog daycares and kennels. Once again - another extreme choice. How long do you do this? For all of spring, summer and fall?? Thirdly (my choice) - keep you dog healthy, supplements (ask about them at your nearby Tailblazers), vitamns, healthy dog foods - and keep them well rested and exercised!! JUST LIKE HUMANS! If symptoms occur - follow natural remedies such as vitamn C, echinacea and honey with warm water to sooth the throat. Add a humidifier in your room by your dogs sleeping area -Calgary air is dry - we all feel it!! At the end, do your own research and if need be, ask your vet and make the decision on your own. Any questions, feel free to ask us!! Do not be alarmed if your pet starts showing symptoms of Kennel Cough - however also be precautionary that like the Human Flu - it can easily turn from a simple cough to extreme respiratory issues!! If your dog eats, remains happy and active and isn't lethargic - keep an eye on them. However if your dog starts sporting a fever, is lethargic, isn't drinking or eating - take them to a vet immediately to make sure it isn't any other underlying problems. Hope you all found this helpful in one way or another! We are all always learning and that is what keeps us open minded!